Guruvayur is located near Trichur, Kerala.The Krishna temple in the town of Guruvayur is one of the five famous Krishna/Vishnu temples in India. The others are Jagannath Puri in Orissa, Venkatachalapati in Tirupathi, Andhra Pradesh, Nathdwara in Rajasthan and Dwaraka in Gujarat. Guruvayoor is called as “Bhuloka Vaikunta” (the abode of Vishnu on earth). The legend behind the temple is that the present idol once belonged to Lord Brahma. During 'Brahmakalpa era' Sri Narayana gave Brahma an idol blessed with all his powers. Brahma was worshipping that idol and was doing his role of The Creator. Meanwhile in the earth, a divine couple, Sudhapas and Prishni were childless and were performing a penance towards Brahma. Brahma was delighted over their devotion and presented him with the idol that was given to Him by Sri Narayana. The copuple performed daily puja to the idol very sincerely and Maha Vishnu appeared before them. He blessed the couple saying that they will be born in the earth three more times and in all the rebirths, MahaVishnu Himself will be born to them as their child. They gave birth to Prishnigarbha. In their next birth, Sudhapas and his wife were born as Kasyapa and Aditi and their son was Vamana. In the third rebirth as Dasaratha and Kausalya, Vishnu was born as their son Rama. In the fourth rebirth as Vasudeva and Devaki, Vishnu was born as their eighth child Krishna. God Krishna installed this deity at Dwaraka and worshipped it knowing that it is none other than Himself . When it was time for Sri Krishna to leave the world for Sri Vaikundam, Krishna then gave his disciple Uddhava this idol and instructed him to entrust Bṛihaspathi with the task of taking the deity to a suitable location and He left. A great deluge had closed in on Dwaraka, but Bṛhaspati,with the help of his prime disciple Vayu, salvaged and saved the deity floating on a leaf in the water . Bṛhaspati and Vayu went around the world in search of a suitable place to install the idol. 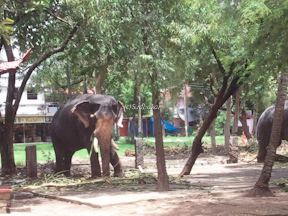 At the same time Parusama came searching for the idol at the behest of Naradha. He met Brahaspathi and Vayu with the idol. When the three of them were going around they came to a place with a beautiful lotus lake where god Siva and Parvathi were residing. Siva and Parvati welcomed them and told them that this would be the ideal place for installing the deity. Siva permitted Bṛhaspati and Vayu to perform the consecration rites and blessed them. Siva with Parvati then left to the opposite bank. ( later came to known as Mammiyur). Architect Viswakarma himself came down and built a temple. Siva blessed saying that since the installation was done by Guru (Bṛhaspati) and Vayu the place would be known as "Guruvayur". Sri Narayana who is present in the deity became known as "Guruvayurappan". According to legends, the deity worshipped here is more than 5000 years old.In 14th century, a Tamil literary work called "Kokasandesam" , references to a place called Kuruvayur are made. 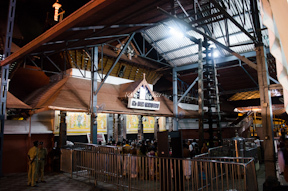 By the end of 16th century Guruvayur had become one of the most popular pilgrimage centre in Kerala. The temple is almost square shaped. There are two gopurams one each on the east and the other on west. As you enter through the east gopuram, the big outer corridor is called 'sutrambalam'. You can see a gold plated 'kodi maram' (flag post) about 100 feet in height facing the sanctum. In the centre is the main sanctum where Sri Guruvayurappan stands in all majesty. Sri Krishna with his four arms carrying the conch Pancajanya, the Sudarshana Chakra in his right hand, the mace (gadayutham)in one of the left hands and a lotus with a Holy basil garland in his other right hand, is a divine sight to watch. Melpathur Narayana Bhattathiri was a great scholar and a well respected person in the then government circles. At that time he was not a great beleiver of Sri Narayana. He affected with rheumatism at the age of twent seven and searched for a remedy. No amount of money could cure his ailment. Thunchathu Ezhuthachan, a well known Malayalam poet and Sanskrit scholar told him - "meen thottu koottuka" (start with fish). Bhattathiri understood the inner meaning of it and decided to present the various incarnations of Lord Vishnu starting with the fish, as narrated in the Bhagavatham in a series of Dasakas ( Groups of ten slokas) . He reached Guruvayur and started composing one dasaka a day in the presence of the Lord. He composed his work in one hundred dasakas. As he completed the 99th dasaka he was completely cured. in the hundreth verse he completely describes the Lord from head to toe. This work is known as Narayaneeyam. After the Nirmalaya darshan, thailabishegam, sangabishekam, are elaborately performed. Uchikala pooja is performed at 12 noon. The temple opens at 4:30 pm again with elaborate deeparadhana. 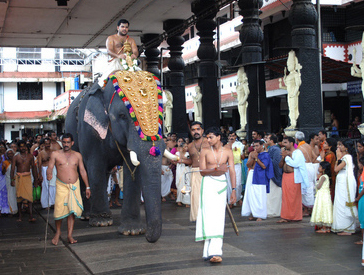 Elephant or elephants beautifully decorated come in a procession in the corridor chutrambalam called seeveli procession. Thulabaram is practice of offering one's weight of materials as coconut, butter,sugar, fruits, copper, silver, gold or any other materials after their prayers are fulfilled.There are three thulabhram counters available in the temple and there is no advance booking for thulabharam offerings. The items are available with devaswom or devotees can perform with their own items. There are other offerings such as Chuttuvilakku which are heavily booked for another 10 years. Annaprasanam is a practice where a child is given solid food for the first time in the temple premises. Dress codes and do's and dont'sStrict dress code is followed for people who wish to enter the Guruvayur Temple. Men are to wear mundu or dhothi around their waist, without any shirts or vests covering their chest.They can cover the chest with angavastram or 'mel thundu' . Boys are allowed to wear shorts, but they are also prohibited from wearing a shirt. Girls and women are not allowed to wear any western wear like trouser or short skirts. Women are allowed to wear sari and girls are to wear long skirt and blouses. Presently the dress code for women have been relaxed to wear churidar pyjamas. Like all other temples in India, footwear is strictly prohibited. You are not allowed to carry cell phones, camera, baggages inside the temple. Be careful if you have infants with you. If they soil the temple sanctum area, the sanctum will be temporarily closed for cleansing and you may have to bear the cost. Temple location It is located 20 kms from Trichur. Where to Stay? There are several cottages near the temple built by the temple Devasthanam. Also there are many budget and semi deluxe hotels in Guruvayur near the temple. Sree Sankara Nilayam Guest House is a decent place for brahmins to stay with very nominal cahrges. You should call on 0487-2553499, or email to gbsamooham@bsnl.in to book in advance. Best Season: Throughout the year. Monsoon( from June to July) could be very wet.